The pound's solid fundamentals will prevail by the end of the year with analysts forecasting a fall in the EUR to GBP conversion as a result. The pound should be stronger according to the Norway's largest bank D.N.B which suggests today's EUR/GBP conversion of 0.7896 is higher than where it will be by the end of the year. Should the pound strengthen to fair-value the equation will be tipped lower. We have been impressed with DNB's research of late following the bank's accuracy when predicting the March decline in EUR/GBP. Analyst Magne Ostnor observed the Brexit-induced selling of sterling in February had seen markets push the EUR/GBP too high, too fast. The resultant recovery in sterling will have netted a handsome profit for those brave enough to haven taken heed of DNB's advice; given, it was a difficult ask at a time when it seemed everyone and his dog were betting against the pound. In a recent note DNB argue the UK currency will appreciate as it becomes increasingly clear that the Bank of England (BOE) will raise interest rates before the current best-bets on the market for the first rise in 2019. This will strengthen sterling as higher interest rates will increase the inflow of foreign capital seeking higher rates of return within the UK. “We think the market is under-pricing the timing and pace of Bank of England rate hikes. We expect the central bank to start hiking in November,” says DNB's Magne Ostnor. The call comes just days after the minutes from the Bank of England's March meeting saw decision makers warn once more that the next move in rates would still most likely be higher on rising inflation dynamics. Talk of higher interest rates, after growing speculation that the Bank could actually cut rates, saw the pound move higher. DNB see the UK's robust labour market and the recent wage increases recorded in January as marking the start of an up-trend in inflation expectations. BoE rate rises will be gradual as the strengthening pound puts downward pressure on inflation, by cutting the price of foreign imports, and the headwind will slow down the pace of cuts. 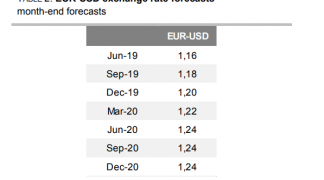 Brexit fears are also forecast to have a “dampening effect” on sterling – so the real price growth will probably mostly come after the June 23rd referendum, as indicated by their forecasts. 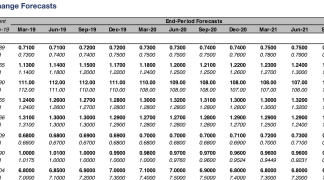 DNB forecast EUR/GBP to rise to 0.77 in one month, 0.76 in three months and then fall to 0.72 in 12 months’ time. The exchange rate is currently at 0.7583. The graphic above provides a visual of the bank's forecast (maroon line, entitled "DNB"), compared to the forward rate (peacock blue line “Fwd”), which is the rate a commercial bank is willing to commit to exchange euros for pounds at some specified date in the future. The light blue line entitled CF Mar 16 refers to the ‘consensus’ forecast – which an average of many different analysts’ forecasts. The dark blue line entitled PPP refers to the Purchasing Power Parity (PPP), which is a way of calculating the ‘true’ value of one currency against another. PPP is calculated by finding the exchange rate at which a basket of goods priced in euros is exactly equal to an identical basket of goods in pounds. 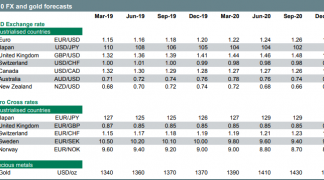 The PPP rate and Forward rates are both above the current exchange rate suggesting fair value lies above today’s rate and therefore that the currency should drift higher, but DNB expect the opposite. Interestingly, if we were to use the PPP as a true reflection of where fair value lies, then the exchange rate is actually moving in the right direction. 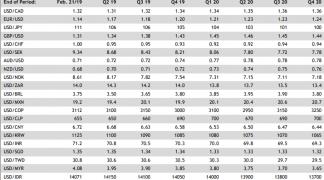 It is also interesting to note that the 'markets' - as signified by the forward rates - are apparently more aligned to PPP than they are to analyst forecasts. The analyst community has been at odds with reality for some time now but it is worth pointing out that a currency can trade at above or below fair value based on PPP for years at a time.